Built in 1856, the Whaley House was once home to the Whaley family, as well as a granary and San Diego’s first commercial theater. Today it is a California historic landmark and a must-see for ghost seekers. 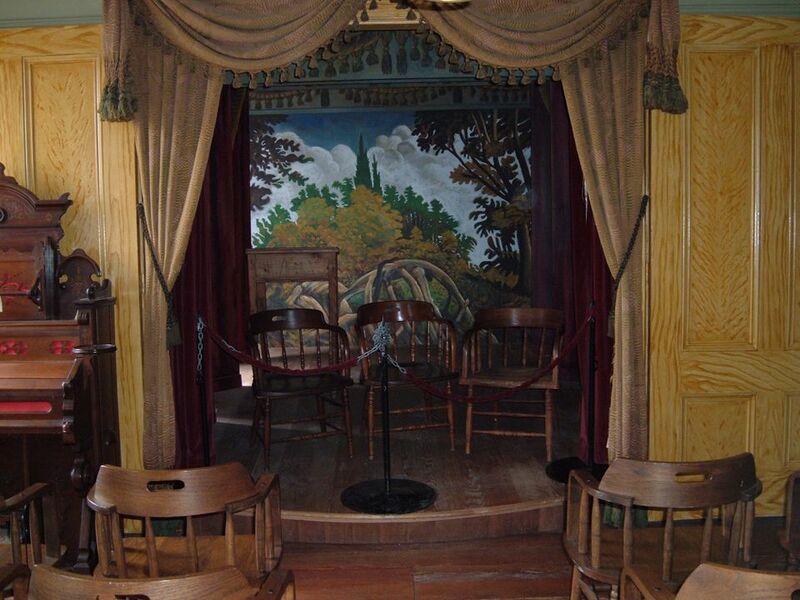 The ghost sightings at the Whaley House go way back; Thomas Whaley and his youngest daughter Lillian were both said to have frequently heard the steps of "Yankee Jim," who was a man executed on the property before the house was built. After the last member of the Whaley family died and the home was turned into a museum, three members of the Whaley family remained behind and frequently appear to guides and visitors. Even TV personality Regis Philbin reported seeing the ghost of Anna Whaley during his visit. Located right in the historic Old Town of San Diego, the Whaley House offers ghost enthusiasts age 12 and up the chance to take a 90-minute ghost hunting tour of the house and learn about paranormal investigative tools and techniques. October is a great month to visit. The museum runs spooky events all month and stays open until midnight on Halloween. Once you’ve had your fill of ghosts, Old Town San Diego is a great place to explore with restaurants, shopping, and the Old Town San Diego State Historic Park. If you want to see it all, the city offers a two-hour trolley tour that will show you the sites while teaching you the history of the area. If you're looking for a place to stay, check out the Old Town Inn, which is conveniently located across the street from Old Town's transit center. Opened in 1829, Eastern State Penitentiary was the most expensive building in America and famous for its sprawling layout. The first ghosts were reported by inmates and officers in the 1940s, and have been seen by historians and tourists ever since—dozens of paranormal investigation teams study the site each year working to capture evidence of ghosts. The 11-acre abandoned prison is now home to "Terror Behind the Walls," a small ghost-themed attraction that is designed to thrill. Visitors who want both the history of the prison and a chance to see the spookier side must buy separate tickets for the historical museum and the Terror Behind the Walls attraction. The prison is in Philadelphia’s Parkway museum district and surrounded by other cool spots like the Philadelphia Museum of Art and the aquarium. Some Philadelphia-area hotels offer special deals for prison-bound guests. Try the nearby Cornerstone Bed and Breakfast and choose the "prison package" for complimentary breakfast, street parking, and two daytime prison tickets. Built on ancient Native American burial grounds, the city of Avalon is said to be full of the spirits of people who have died since the city’s founding in the 1890s. It used to be a go-to place for celebrities looking for a break from the spotlight of Los Angeles, and famous people such as actress Natalie Wood and author Zane Gray both died on the island and are said to remain today. The easiest way to get to Catalina Island is via the ferry that runs out of four different southern California ports. It's an hour ride, and Avalon itself is only about one square mile, so a day trip from the mainland is definitely doable. Ghost tours run nightly and take you throughout Avalon and all of its secret history-filled spots. It is a walking tour and lasts about an hour, so make sure to wear comfortable walking shoes. If you choose to stay for a night or two, Catalina Island has tons of activities for every traveler. Try hiking the trail from the Catalina Conservancy up to the summit of Mount Orizaba. You’ll get to see the native plants in the conservancy and beautiful views of the whole island in one venture. For the less adventurous, there are multiple spas, beaches, and shops that are a relaxing way to pass the time. Built between 1722 and 1732, Lafitte's is thought to be the oldest structure used as a bar in America. French pirate Jean Lafitte used it as a front for his smuggling operation during his day and now supposedly haunts the premises. It is rumored his stolen treasures are hidden somewhere within the walls. Lafitte's sits right in New Orlean's French Quarter on the famous Bourbon Street. The Ghost City Tour makes it a stop on its walking tour and offers a 21-and-older haunted pub crawl that includes Lafitte's. If you can, be sure to plan for a few days stay in New Orleans once you’ve been thoroughly spooked by its ghosts. The city is famous for its food. It is worth your time to sit down for a bowl of gumbo at the Commander's Palace or grab a beignet at Café Du Monde, a New Orleans staple since 1862. The setting and inspiration for "The Shining," the Stanley Hotel, stands today as an operating hotel with, according to the employees, "only happy ghosts." Storied novelist Stephen King was inspired to write the book that the movie was later based off of after a one-night stay. He slept in room 217 where the ghost of a housekeeper who was electrocuted there in 1911 supposedly lurks. The deceased founders of the hotel, Freeman and Flora Stanley, are also said to prowl the grounds, running operations as per usual and frequently appearing to guests and staff. The hotel is surrounded by the towering peaks of the Rocky Mountain National Park in the small town of Estes Park. Nighttime ghost tours are discounted for hotel guests, but the public is welcome to tour the hotel for a chance of spotting Freeman and Flora if they desire. For those not wanting to spend their nights even with "happy ghosts," the town has many other lodging options, including campgrounds and home rentals. A two-hour drive from Denver, Estes Park offers every activity an outdoor enthusiast could ask for, from wildlife watching to hiking and biking, and even golf for the adventurer in need of a day off. Fort Mifflin is a national historic landmark and one of the few remaining battlefields from the Revolutionary War. It was also used as a prison for captured Confederate soldiers and union deserters during the Civil War. Today it is a tourist site and hot spot for paranormal investigations. The ghosts of soldiers and prisoners killed during the wars are said to roam the fields along with a particularly vocal spirit dubbed "the screaming woman." She is frequently heard howling into the night in eternal grief and regret for the daughter she disowned after she took up with an officer, and who later died of dysentery at the site. The fort is roughly a 25-minute drive from downtown Philadelphia. Hours change with the season so be sure to call ahead of time to check. The site offers many shiver-inducing experiences for visitors and a series of special events throughout October. For the easily spooked, there are also three-hour candlelight tours. Robert the Doll is a 40-inch straw-stuffed doll that has been causing mischief since the 20th century. He originally belonged to a little boy named Robert Eugene Otto, fondly called Gene. When he got him, Gene named the doll after himself and they became constant companions. When weird things started happening in the Otto family home, Gene would always blame it on Robert. According to family legend, Gene would wake up screaming in bed in the middle of the night with all of the furniture in his room overturned. According to Gene, it was all Robert. The doll was moved to the attic as Gene grew up and was left behind after the Otto family moved out. Later tenants reported hearing footsteps in the attic and objects moving around rooms when their backs were turned. Today Robert lives in the Fort East Martello Museum in Key West. Be cautious if you go; Robert is said to cast curses on unsuspecting guests and is surrounded by notes asking for forgiveness from people who think they are hexed by him. The museum is open daily. Key West is the southernmost island in the Florida Keys and is a great October destination for those who aren't ready to give up warm summer-like temperatures quite yet. A hot tourist destination, Key West has its own airport 10 minutes from the downtown area and is accessible by car via the Overseas Highway. It takes roughly three hours to drive from Miami to downtown Key West. A 45-minute drive from Baton Rouge, Myrtles Plantation is a beautiful mansion from the 1790s with a haunted past. The first resident was "Whiskey Dave," also known as General David Bradford. He was a local lawyer and the leader of The Whiskey Rebellion. He was a leader without a plan and after the rebellion’s fail, he was forced to flee the United States to Bayou Sara, a Spanish colony that today is St. Francisville. Bradford bought 650 acres there in the hopes of starting a new life. In 1820, it was sold to a local man named Judge Clarke Woodruff and this is where the haunted history of Chloe, the plantation’s most famous ghost, begins. Chloe was a slave on the plantation who was involved in an affair with Judge Woodruff. She feared she would be kicked out of the house once the judge took up with another girl, so she devised a plan to make his kids sick so she could nurse them back to health. Her plan took a disastrous turn when she accidentally killed the children instead. She was hung on the plantation, but her spirit managed to stay in the house. She was first spotted in a 1992 photo and has been appearing in guests' and visitors' shots ever since. The plantation offers mystery tours on Friday and Saturday evenings. Reservations are strongly recommended as space is limited and the tours are popular. You can also take a private mystery tour. If you want more time to try and get a shot of Chloe, the plantation is an operating bed and breakfast. Stay in the General David Bradford suite for a true taste of history. The eight acres that the haunted Wood Island Lighthouse sits on was purchased in 1808 by the U.S. government to guide fishermen in and out of Winter Harbor. Its haunted history begins in 1896 when the lone resident of the island killed his tenant and then himself. The spirits of the two men still haunt the island according to local lore and draw many a paranormal investigator. Visitors can take a boat out of the town of Biddeford to reach the lighthouse. Knowledgable volunteers guide the journey and share the haunted history of the lighthouse. Those age 12 and older can even climb the lighthouse tower if they'd like. Biddeford is a 25-minute drive from Portland, which is worth a visit if you have the time. Take a walk along the Eastern Promenade Trail for beautiful coastal views or browse the local produce at Portland's year-round farmers market. Built in 1927, the current day Moss Beach Distillery was a successful speakeasy during the prohibition. Celebrities and politicians would drive down the coast from San Francisco and enjoy the beautiful views and booze. At the end of prohibition, it was officially opened as a restaurant and bar. The establishment’s most famous guest during its speakeasy days was "The Blue Lady." According to legend, she was a married woman who struck up an affair with the shady bar piano player who, once he found out about her husband, murdered her on the beach below the distillery. She lingers at the spot, playing tricks on visitors and staff at the restaurant. Moss Beach Distillery is located 35 minutes from San Francisco, between Half Moon Bay and Pacifica. It is a beautiful area, with endless beaches and forests to explore. If you’re staying in San Francisco, take a drive down the coast on Highway One—you won’t be able to take your eyes off the coastal views.